Moving northwest of Rokko Island and the Wangan Expressway we come to the Nada District (famed for its sake) and the Nada Bridge. It's a two span steel through arch bridge on Y-shaped bents. 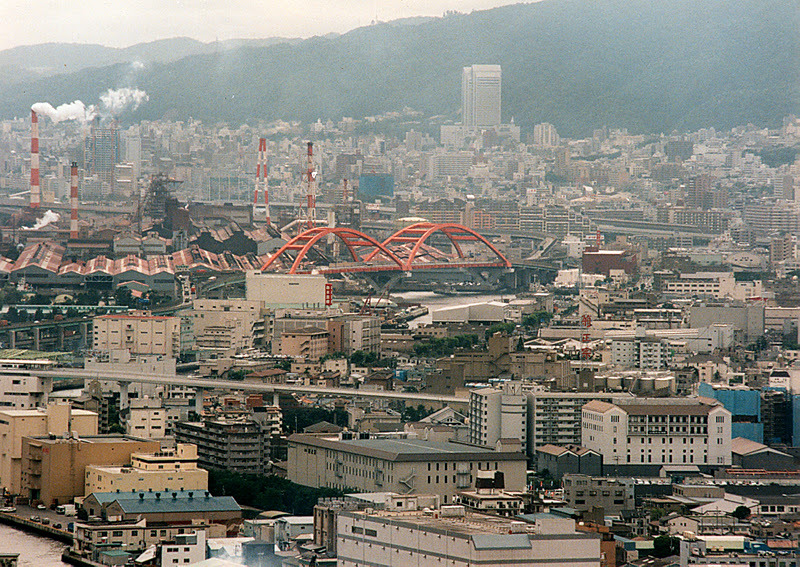 The bridge connects Nada Island (an artificial island that also supports the north end of the Rokko Bridge) and the Kobe Steel Works. The Nada Bridge is 370 m long with spans of 190 m and 180 m. Its 18 m wide and has four vehicle lanes on the east side but it widens to six lanes to provide two off-ramps on the west side of the bridge. It has big steel floor beams under the deck which are directly supported by steel V-shaped cables coming down from the arch. It was built in 1983. We'll take a closer look at the Nada Bridge tomorrow. Osaka Bay Bridges: Nada Bridge (1) by Mark Yashinsky is licensed under a Creative Commons Attribution-NonCommercial-ShareAlike 3.0 United States License.